Well it didn't take long for us to find out. After a gruelling 15 hours on the bus from Albuquerque, we are tired, grouchy, smelly and in need of some strong coffee. We had planned to drop bags off at the hotel, walk to a gathering of street food vendors, then grab a drink whilst we take in the sights of this concrete jungle. But then we walk outside and all those plans turn to mush as the heat smacks us in the face. I feel like the city is trying to convince us that it's not that hot by dotting elaborate fountains on every street corner, unfortunately hearing the sound of water is not refreshing but I would really like to have a paddle. After getting to the hotel and digging out our most flowing and minimalist clothing, we head for the air conditioned oasis that is 'weekend coffee'. Set inside a swanky looking hotel and with a cold brew contraption that looks more like a torture device, we get our first taste of Texas hospitality. We had heard that the people of Texas are some of the friendliest you will ever meet and so far this rings true. The staff are happy to chat and guide us in the direction of coffee choice even though I have ordered it using the most shocking attempt at an American accent "can I have a cwaffeee please" (note, I didn't do this by choice it was a request by the barista) to embarrass ourselves further, Georgia is asking a man if she can stroke his dog, stroke is not the word for this seemingly innocent request ( it's 'pet' apparently) and the man replies back in surprise " you wanna stroke my wiener dog?!" It's time to leave. Not before grabbing a slice of cake that some genius has put together. Slice of brioche, dipped in dulce de leche, topped with toasted marzipan and flaked almonds. The amazing people at Cool Haus, not only make some of the most delicious sammies you can get your mits on, but they've also solved one of the biggest dilemmas you have whilst eating one. "Do I lick the napkin or not?!" You guys must know what I'm talking about? Whenever I get an ice cream (cone, tub or Sammie) that's been wrapped in a napkin, I get a pang of sadness knowing that I might have to throw the ice cream soaked napkin away at the end. So when the ice cream is really THAT good, I just lick the napkin, no biggie (I instantly regret it as I just end up with a mouth full of soggy paper.) The people of Cool Haus have solved this problem, by wrapping the goods in edible rice paper. After a short wait, we come away clutching 2 'architecturally inspired' sammies. Fighting the urge to rub it over my boiling face, we find a seat on the edge of klyde warren park which has turned into the scene of an epic water fight battle. It's looking pretty unfair judging by the size of water guns that the adults are holding compared to the kids cracker size versions. My caramel like, brown butter and salty candied bacon ice cream is squashed between 2 soft set snickerdoodle cookies dusted in cinnamon sugar. Georgia has gone for an exotic coconut negroni ice cream which involves a refreshing blood orange and passion fruit flavour with toasted coconut, sandwiched between two unbelievably morish S'more cookies. I was trying to justify to Georgia why I needed another one but she thinks the enjoyment is lost a bit as you have to eat it so fast. If you don't, you're gonna lose it to the floor as it melts so quick out here. Deciding on which BBQ to choose in Dallas is one hell of a hard decision. On every street corner there seems to be another smoke house pulling you in with the beautiful smells of meat and wood! (Now that would be a good aftershave frangrance!) Luckily we'd been given a heads up about a place that was once voted one of the best spots to eat BBQ in the whole world! Filled by passion, mesquite wood and a little oak, the family owned Pecan Lodge know how to cook serious BBQ and the people of Dallas are flocking here all day everyday to satisy their meaty needs and to sip on some great craft beer. What to order? I feel like a kid in a meat candy store and I can't make my mind up. After being talked down by Georgia from ordering one of everything on the menu. we walk away with a few goodies to share. Mountain of juicy pulled pork, 2 of the smokiest pork ribs that are so tender, you can see it's struggle to hold on to the bone and 2 slabs of rich smoked brisket. The fried okra are like little golden crispy pops and a southern tradition. No cutlery was used in the eating of this meal but now we know why they put a whole kitchen roll on the table. We walked away with some seriously satisfied bellys, a doggy bag full of leftovers and a bad case of the meat sweats. I think I may have over done it last night as I feel like I've woken up from a food coma not a good nights sleep. The show must go on and for brunch we're headed in search of something a little more local and relaxed. We end up in the Oak cliff district, a very arty place full of vintage clothes shops, funky bars and plenty of restaurant choices. We pick Oddfellows for its bustling American diner feel. They appear to be known for their fried chicken and waffles but I'm just not ready for that combination yet. 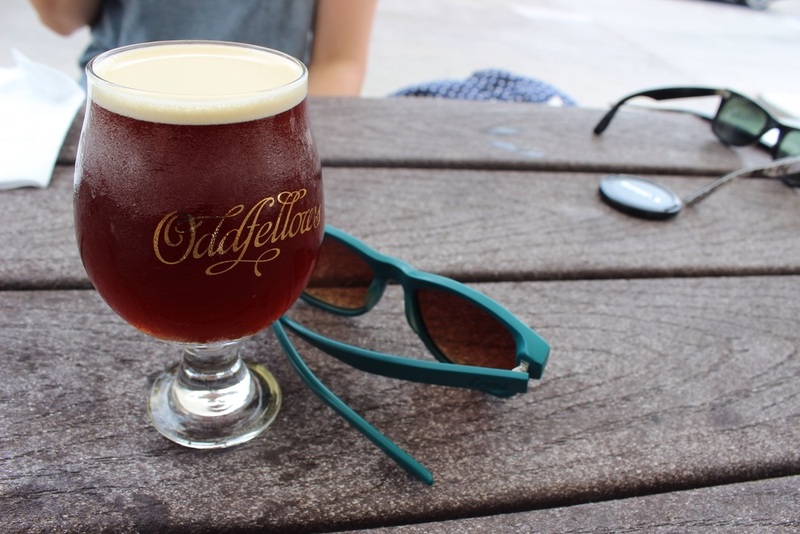 The cold brew coffee is served in a chilled brandy snifter glass, it feels like I'm drinking an ice cold beer for breakfast, it even has the creamy foam head. 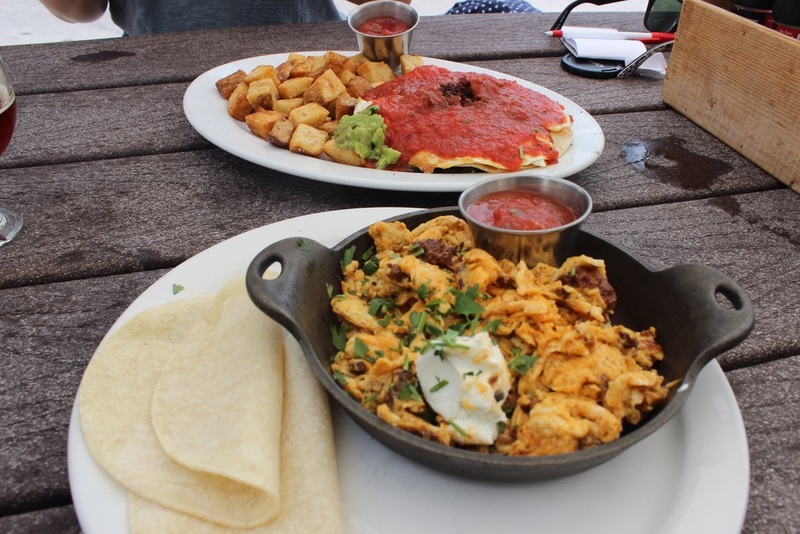 I have a house made wild boar chorizo which is finely ground and crisp from the pan, mixed with a tangy, whipped goats cheese and skillet scrambled eggs, a spicy homemade salsa and foil wrapped corn tortilla finish the dish. Georgia's huevos rancheros is a rainbow of colourful layers. Saucy black beans, runny sunny fried eggs, a herby potato hash and creamy guacamole all a top a house made tortilla and ranchero sauce. Thank you Dallas for showing us what hot really is, we're so excited to see the forecast for Austin is 105°F yay!